In the Museum Store, we are always looking to highlight the artists and vendors that make commitments to ecologically and socially sustainable business practices. 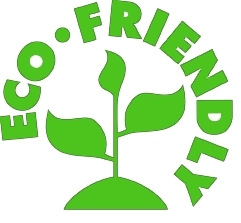 Throughout the store, this logo (left) will tell you that a company uses recycled, repurposed, or sustainable materials and is conscientious about their shipping and packaging. I recently gave a Cate & Levi repurposed wool hand puppet to a dear friend for her baby shower, and it was the perfect gift! See how cute (below)! And each is totally one-of-a-kind because of the material. One of my favorite new eco-friendly lines in the store is Hemptress (below). Hemptress makes adorable and practical handbags that are made primarily of hemp, which requires few chemicals to grow, very little water, and actually replenishes nutrients in soil. 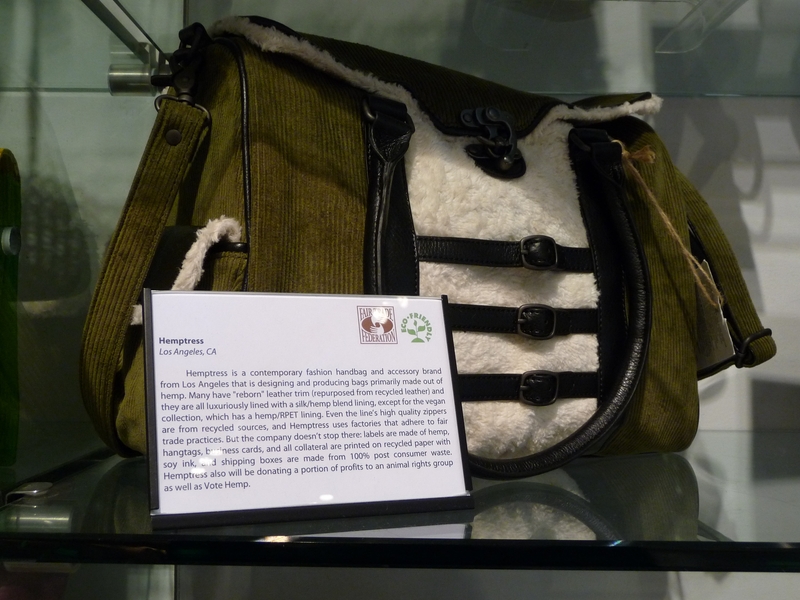 Hemptress maintains its green mindset by using low-impact textile dyes and recycled paper hangtags with soy inks, and it also works with Fair Trade factories to produce their bags. 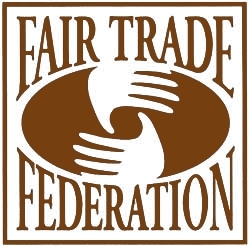 This logo (left) indicates that a company is an active member of the Fair Trade Federation and has undergone a rigorous screening process to prove that the business is committed to fair and ethical business practices, cultivates environmental stewardship, and respects the cultural identity of its artisans and workers. Learn more about the Fair Trade Federation here. 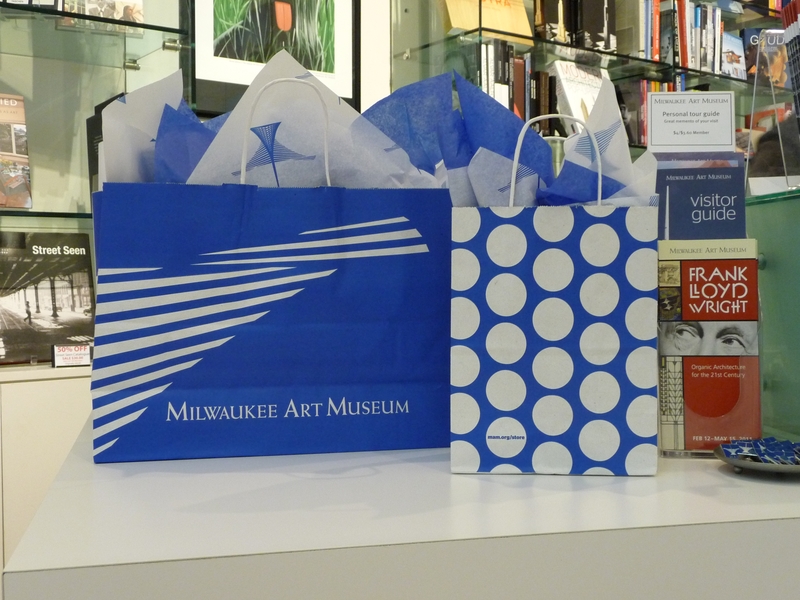 The Museum Store recently launched its own new green initiative: recycled paper shopping bags (below)! Not only are they made from recycled paper content, but they are also made in the U.S.A. (i.e., not shipped all over the planet to get here), and can be repurposed for gift giving because they are so adorable! You can either give a gift in the bag with a bow around the handle or with some tissue paper coming out the top for a little extra flair—or take it apart and reuse the bag as gift wrap. What other ideas do you have for eco-friendly yet fabulous gift giving? 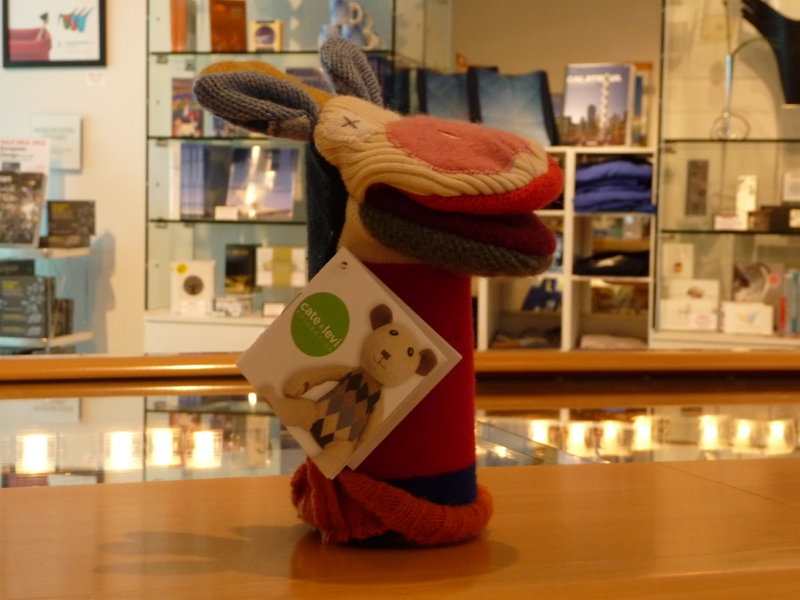 This entry was posted in Behind the Scenes, Museum Store and tagged Museum Store, Sustainability. Bookmark the permalink. I am looking for a vendor that was at Art in Bloom. Victoria Vonier that is located in the Milwaukee area, I think Menominee Falls. She use to own Private Gardener and I bought a myrtle topiary from her and would like to talk to her about possibly purchasing more for Christmas presents. If you could help me I would really appreciate it. My e-mail is knonhof@gmail.com. Thanks in advance for all of your help! By the way, I love Art In Bloom, and am looking forward to it in the coming year. I belong to Town and Country Garden Club in Sheboygan and always talk up AIB to all of my co-members. This last year I had a group of 20 that came down and thoroughly enjoyed the day. Thank you for your comment! I am going to pass it on to the educator in charge of Art in Bloom, who I am sure will be able to get you the information you ask for. We’re so glad you like the Art in Bloom event, and we look forward to seeing you here again in 2012!